Today, the 28th. Feb., marks the end of Carl's Sci Fi experience. I've never known two months to fly by so quickly! My original post about it is here. 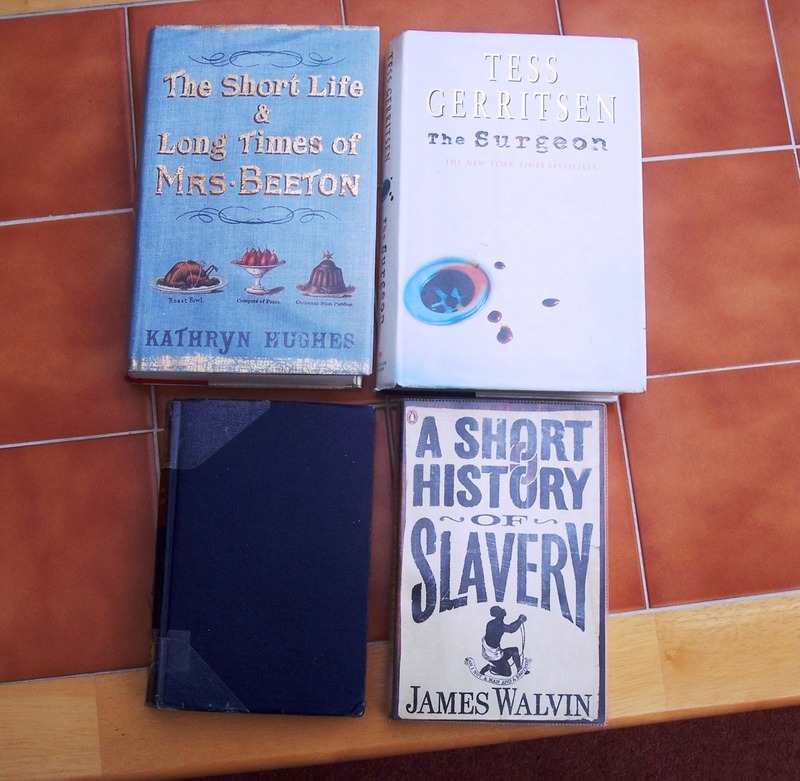 I note I was hoping to read three books, which I did, but not precisely the three books I was thinking I would read! One was on the list, two were not. I loved all three. And what's really nice is that these two authors are sort of new discoveries for me (I have actually read one MZB before) and will form the backbone of my sci fi reading for the rest of the year because I absolutely love both their writing. Mainly I think this is due to the strong female characters in their books, it makes such a refreshing change. But it's not just that, the books were all strong in plot, pacey, and imaginative. A word or two about my final book. Crossing the Line is book two in Karen Traviss's Wess'har sci fi series. It continues where book one left off and sees Shan Frankland, her body altered by c'naatat, the infection she picked up from the alien, Aras, now living on the planet of Wess'ej with Aras's people. She has a lot to learn. She has no idea, for instance, that her dominant personality will cause leadership problems among the matriarchs who rule the cities. What she does know is that she is a hunted person among humans. The secret of her longevity is out and various groups are all after the germ that has infected her. She also knows a war is looming between the Wess'har and the Isenj and that humans have sided with the latter but are, in all likelihood, destined to be caught in the middle. In all, five species will affected by the coming conflict and the worst thing of all would be for Shan to be caught by those who would use her blood to create a race of beings who cannot die. Best of all about this series, imo, is the plausibility of the aliens. All so different, from the Wess'har with their sea-horse type heads, to the spider-like Isenj or the Ussini who resemble meerkats. Every single one is vividly described, but not just physically... their various species' traits are also so real they could actually exist. Aras stiffened. "It's not about species. It's what you do. Do you know what I despise most about you?" His tone,as ever, was deceptively even, like a priest giving absolution to a monster and trying hard not to let his personal revulsion show. "Your unshaken belief that you're special, that somehow all the callousness and careless violence that your kind hand out to each other and to other beings can be forgiven because you have this... this great human spirit. I have viewed your dramas and your literature, you see. I have lost count of the times I have seen the humans spared by the aliens, because, despite humanity's flaws, the alien admires their plucky spirit and ability to strive. Well, I am that alien and I don't admire your spirit, and your capacity to strive is no more than greed. And unlike your god, I don't love you despite your sins." For someone who grew up with Star Trek and Dr. Who (who adores humans) that kind of thing is shocking to read because it's so much the opposite of what we've been fed over the years. It made me think hard about us as a species and that's never a bad thing. And the other thing is, as I mentioned before, the strong women in the books. Not just Shan but the matriarchs on Wess'ej who feature strongly in this second book; hopefully we'll see a lot more of them in the next four. I have the next two and am literally forcing myself to keep away from them as I have several other books I must read first. Thanks go to Carl for hosting this 'experience' once again. I feel really indebted as it's brought me back to science fiction, which was always my first love, and this will now enrich my reading for the rest of the year. 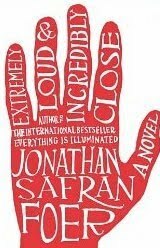 I reserved Extremely Loud & Incredibly Close by Jonathan Safran Foer after reading about it here on Stuck in a Book's blog. His housemate was the one who read it, not him, and I was so taken by the description that I reserved it from the library. All that said, I've no idea where to start because if you fancy a read that is different, this is it. Oskar Schell is a nine year old who is interested in everything. Primarily he's an inventor but that doesn't stop him being into natural history, making jewellry, astronomy, playing the tamborine and so on. He lives with his mother and 'Ron', his mother's new partner. It quickly becomes apparent that Oskar is grieving and we soon learn that his beloved father was killed in the 9/11 attacks two years previously. While rooting around in his father's closet - which has never been cleared - Oskar finds a blue vase and accidently drops it on the floor, shattering it. Inside he finds an envelope marked 'Black' and inside that, a key. Investigating further he finds that the lock it belongs to is not in their appartment. Oskar decides that the key must have been of some importance to his father and assumes that 'Black' must refer to someone of that name. Thus he sets about tracing every person named Black in the entire New York phonebook. Along the way we learn that the member of the family closest to Oskar now, is his grandmother and, paralelling Oskar's search, we hear her story of her early years in Germany and the bombing of Dresden. Her husband left her when she was pregnant with Oskar's father. He could no longer speak and when she fell pregnant was unable to bear the thought that he might one day lose his child. Oskar's search for peace of mind and possibly even to discover how his father died in the attack - there was no body - leads him through the five boroughs of New York (one lovely story Oskar's father told him was about the possibility that there were once six) and to touch the lives of many strangers. Goodness, what an amazing book. Some of the details are so touching or downright tragic that I was moved to tears. And yet it's not a sad book really. Oskar is such a wonderful character, intelligent, earnest, compassionate and so full of hope, as children are, that you can't help but root for him in his quest for answers. I have to say I did wonder if the author had endowed Oskar with more intelligence than his years would suggest. And would a nine year old really be allowed to wander New York in that manner? It doesn't really matter, I'm good at suspending disbelief and the story itself makes you forget any lingering doubts you might have about reality. The writing style is weird. The book is illustrated with photos of whatever might be being discussed on the page and in places there are pages with just one sentence or where the writing is so dense you can't read it. All this adds to the experience of reading something very unusual and reminded me slightly of The Curious Incident of the Dog in the Night-time. Although, to the best of my knowledge Oskar is not supposed to be autistic as the young boy in that book is. Some might find themselves irritated by the style. My husband asked me what on earth I was reading and shook his head when I tried to describe it. It's not a book he would have the patience to read because patience is required. This is not a pacey, 'bare bones' sort of a book. I liked the additional historical detail. Though perhaps 'liked' is not the correct word to use - the description of the bombing of Dresden in WW2 shocked me to the core. Ditto a testimony from a woman who suvived the bombing of Hiroshima and was searching for her daughter. Oskar's retelling of things he had read about 9/11 were also gruelling. I've read very little about it to be honest, feeling that I have sufficient imagination to imagine the horror of dying like that, without needing to read about it. It did me no harm though and probably did me a lot of good - one can be a bit cosy in one's life sometimes. All in all this is not a book for everyone. 'Pretentious' is a word I've seen used to describe it (I don't agree). Sadness and tragedy abound and reading how a nine year old child comes to terms with a terrible loss is maybe not everyone's idea of entertaining reading. But I'm so glad I read it and if you can steel yourself it's well worth the effort. The library seems to be a place I really can't keep away from, even though I really don't need any more books at the moment. 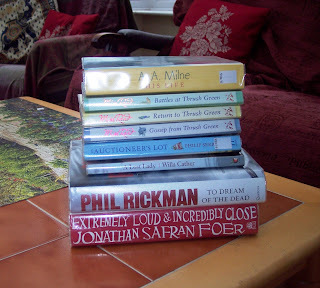 My excuse is that I had a reserved book to collect and a couple to take back, including the biography of A.A. Milne that I had been looking forward to reading. The reason I returned it was because the print turned out to be too small for my middle-aged eyesight! Upset? Me? Just a bit... Anyway, I've reserved a hardback edition and hopefully that'll be okay. A Short History of Slavery by James Walvin. I've no idea why I picked this up or whether I will even read it, but I hope I will. Mariana by Monica Dickens. I saw this blogged about very recently and am not now sure where it was. Apologies. But I thought it sounded like a good read so I reserved it. Expecting a pretty Persephone book to arrive, instead I got this battered blue volume. LOL. But that's fine, what's inside will be exactly the same. So those are my newest library acquisitions. I have four others unread and two I'm in the middle of. Ten, in other words. Five more than I set as a limit at the beginning of January. No answer to that really, is there? Pat at Here there and everywhere did this meme a couple of days ago and I couldn't resist nabbing it from her to do myself. My grandchildren's artwork on the fridge. 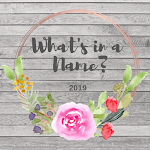 What are your two favorite names? What do you consider a necessary luxury? My computer. Although I'm not completely certain it passes for a luxury these days. What type of car would you like to drive? What is your favorite color and has it changed over the years? Blue. And no, it's always been blue. I put it down to being born and brought up by the sea. What is something you long for? For people to stop fighting over religion... or anything at all to be honest. If money were no object what would you buy yourself? A library. Well... not a ready made one... a place where I could create my own. What book have you just finished reading? The Forbidden Tower by Marion Zimmer Bradley. Name one book that made an impact and why? Not So Quiet by Helen Zenna Smith because it underlined the fact that some women also went through hell at the front in WW1. Name one liquid always in your fridge? Name one food item always in your fridge? What could you eat everyday? My homemade onion, celery and potato soup. Name a favorite fictional character from a book. Just one? Oh Lord. Uh... Sherlock Holmes. What phrase or motto do you over use? Not sure about 'over use' but I often say, 'What goes around, comes around'. Books. 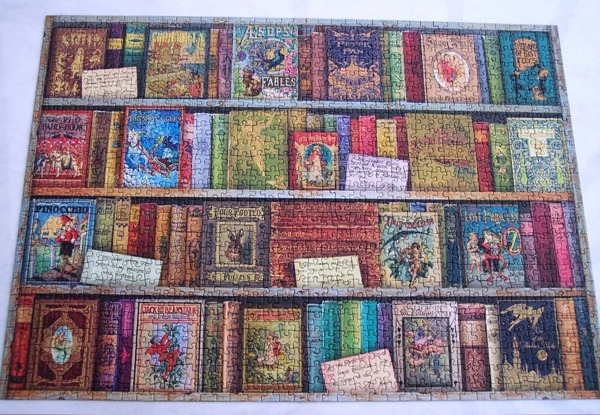 Jigsaw puzzles. Jazzy socks. DVDs. Look out at the view from our house and think how fortunate I am to live in such a beautiful part of the country. I'm allergic to both but if I wasn't - cat. These are part of the two science fiction series I want to read this year. Three books from the Wess'har series by Karen Traviss and two from the Darkover series by Marion Zimmer Bradley. To me all these covers shout, 'Read me!' 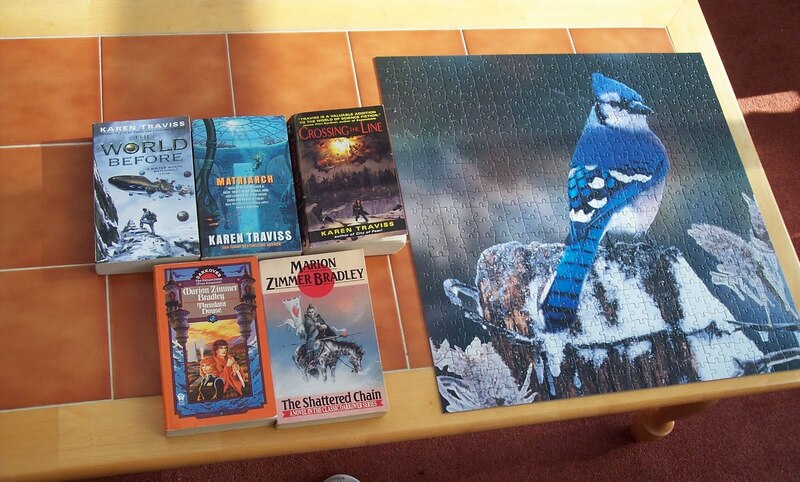 And the pic on the jigsaw, you'll hardly need telling, is an American bluejay, a bird we don't have in the UK. It reminds me of a meal we had with some dear friends near Pittsburgh. The restaurant was on a level with the tops of the trees and they fed the birds too, so all you could see outside were loads and loads of bluejays. For a birdwatcher like me that was just magic. It's over a week since I posted here and it's not that I haven't been reading, I just haven't had a chance to blog about the three books I read in that time - too busy. Anyway, my main read this last ten days has been The Forbidden Tower by Marion Zimmer Bradley. I've been reading this for Carl's Sci Fi Experience and this is my second book for that. Goodness, where to start? Well. The book takes place on the planet of Darkover and concerns four people: Andrew Carr, a Terran, twin sisters Callista and Ellimir, and Damon Ridenow, an exile from the tower of Arilinn and a member of one of the ruling caste. They are all telepaths. Damon and Ellimir are engaged to be married and so are Andrew and Callista. Andrew and Callista met in the previous book when Callista was captured by the catpeople and buried alive - Andrew was the only person who could communicate with her telepathically. They fell in love without actually meeting. It all sounds hunky-dory but of course it's not. Callista has been in training for many years to take over as Keeper of Arilinn tower from Leonie. (The towers somehow run things on Darkover and there're about half a dozen of them.) She has to beg Leonie to release her. Leonie is not best pleased as she is now elderly, and anyway there are complications. The training subdues sexuality in ways not really known, or known only to Leonie. The two marriages take place with the full knowledge that Andrew and Callista will not be able to consummate their marriage until Callista can be fully set free from the confines of her rigourous training. Physical contact is unbearable to her and if they try before she is ready, Andrew could be killed. Damon, himself almost a Keeper before he was exiled by Leonie, is the key to it all. Only he has the knowledge and the daring to free Callista. In the meantime the four, bound telepathically into a very tight-knit group, have to support each other through many trials and tribulations in order to discover exactly 'how' reliant they must be on each other in order to get through this. Marion Zimmer Bradley's 'Darkover' series is quite well known I believe. There are over twenty books which all take place at various times during the planet's long history. 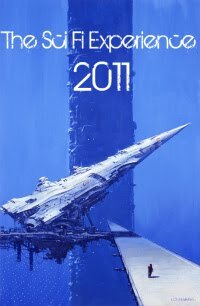 This is my second Darkover book, the first being Darkover Landfall which told the story of how a group of Terrans crash-landed on the planet and what happened to them. I think it was the first book written but am not sure. I gather the books were all written to standalone and from what I can see this is the case. The Forbidden Tower is about in the middle of the series but I had no problem understanding what was going on... it seems like a series that is not actually a follow-on series in the true sense of the word. Anyway, what this book does most successfully, imo, is make you think about the nature of sexuality. Just because we go the monogamous, 'pairing off' route on Earth, is that the only way... or indeed the 'right' way? Whatever your feelings on the matter it never harms to listen to other opinions. Ursula Le Guin did it brilliantly in her short story book, The Birthday of the World, I can't recommend that highly enough, and this is another book in that vein. Andrew is Terran and has firmly entrenched ideas and these ideas are almost as big a block to the new, fragile marriage as Callista's problems are. I must add that this is not an explicit book in any way shape or form, so anyone who dislikes that sort of thing need not fear. This is not a hard-nosed science fiction novel. It's a story about how relationships work and have to be worked *at* to survive and thrive. But there is also conflict within the wider family and also between the rulers (towers) of Darkover and Damon Ridenow who wants change in respect of how Keepers are trained and how telepathy is used outside the towers. All this too made fascinating reading. All in all, an excellent read. It's quite a dense, complicated novel, so not a quick read, but that was its charm for me. I read it slowly and savoured the good writing and twisty plot and enjoyed the strangeness of an alien planet but also the similarities. I have more Darkover books to read and *cough* two more on the way. I think I'm going to love this series to bits. The Captive Reader and Marg from The Adventures of an Intrepid Reader that encourages bloggers to share the books they’ve checked out from the library. If you’d like to participate, just write up your post-feel free to steal the button-and link it using the Mr. Linky any time during the week. 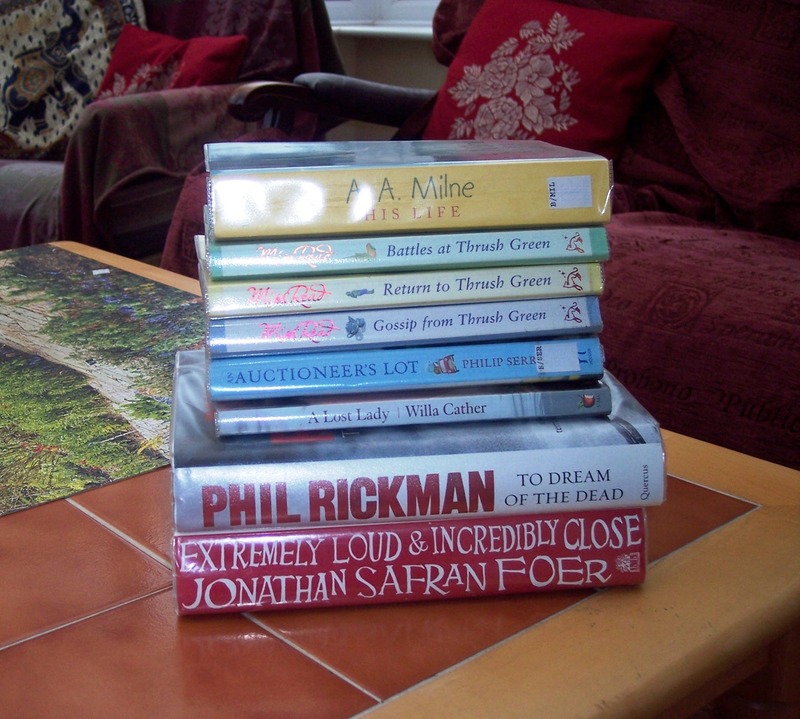 And of course check out what other participants are getting from their libraries! Extremely Loud and Incredibly Close by Jonathan Safron Zoer. I read about this book here on Stuck in a Book's blog and was so intrigued I reserved it from the library. I suspect it might be one of my more unusual reads of the year. To Dream of the Dead by Phil Rickman. A survivor from my last library loot. I *will* get to this. A Lost Lady by Willa Cather. A random grab, mainly because several people whose blogs I read love her books. Auctioneer's Lot by Philip Serrell. The author is a regular expert on the BBC's Bargain Hunt programme so I thought this one might be fun to read... quirky stories etc. A.A. Milne: His Life by Ann Thwaite. Totally random grab this one. South Molton library had a good selection of biographies (better than ours) and this one just jumped out for some reason. So there you go. Bit of a mixed bag but all looking like good reads.